Every beauty lover loves a good Sephora haul. Whenever I get the chance to go, I stock up, because unfortunately the UK doesn't have a Sephora (*cries*). I recently went to Barcelona, and had a little haul in their Sephora - which, btw, is bloody amazing! 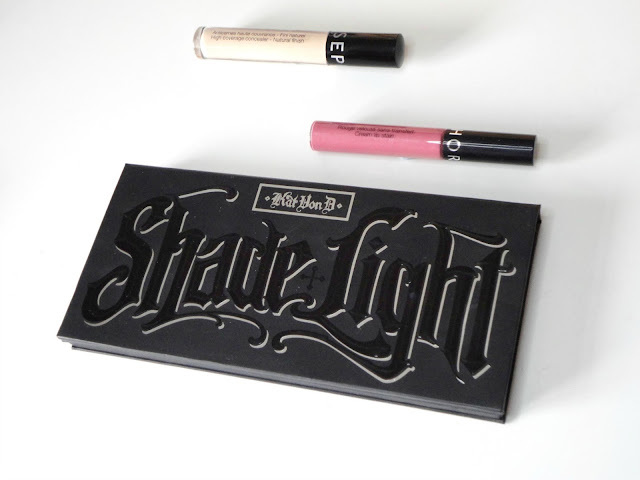 Firstly, I got the Kat Von D Shade & Light contour palette. I have been lusting after this for so long, especially because I have been avoiding getting the Anastasia one as I've heard this one is better for fair skin. I'll have a full review up of this very soon once I've had the chance to give it a good try! I then got the Sephora matte lip cream in 06 Pink Souffle. This is a slightly brighter pink than MAC 'Brave' and I absolutely love it. It's a slightly mauve pink, which is my fave lipstick shade, and I love the formula of these lipsticks! They're not quite a full on matte liquid lip but they're a great in-between for anyone who doesn't want anything too drying. Again, I'll have a full review of this up soon! Finally, Lustrelux convinced me I needed the Sephora Bright Future Gel Serum Concealer. I got the shade Creme, which I think should work with my skin tone, and they did have a pretty good colour range available. I've got a 'New In' post coming up soon featuring this concealer so keep an eye out for more details! What's on your Sephora wishlist? Let me know in the comments!